Back in the 1950s, the Detroit Red Wings were nearly unstoppable. That is, until Jack Adams broke up the band. But before Adams could attempt his own rebuild, the franchise won four Stanley Cups in six years. 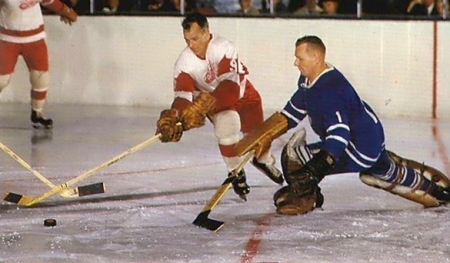 Between 1950 and 1956, the Red Wings and the Toronto Maple Leafs met in the Stanley Cup semi-finals five times. Detroit won every series, but the games often got heated between the two rivals like most postseason contests do. As most hockey fans know, anything can happen in the playoffs. For Detroit’s 1956 squad—one that featured Gordie Howe, Ted Lindsay, Glenn Hall, Red Kelly, “Dutch” Reibel, Alex Delvecchio, Marcel Pronovost, and other Red Wings legends—that was no different. That postseason’s obscure event centered around “Terrible Ted” – literally. Of the five playoff matchups, only the 1950 best-of-seven series was close, with the Red Wings needing a Game 7 overtime goal by Leo Reise Jr. to eliminate the Maple Leafs. In Game 1 of that series, Gordie Howe had collided with Leafs captain Ted Kennedy and crashed heavily into the boards, fracturing his skull and re-arranging his facial features. Doctors moved quickly to save Howe’s life, let alone his hockey career. 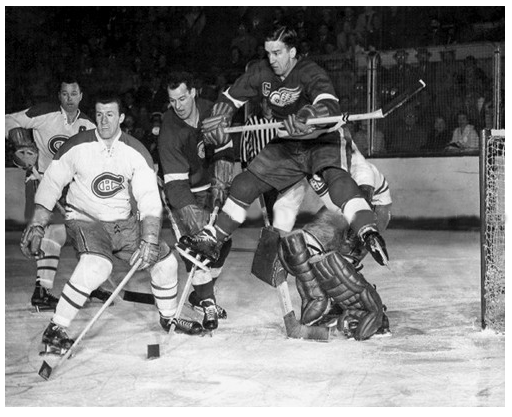 The heroic Wings won the series and later the Stanley Cup for Gordie. Gordie Howe deking around Johnny Bower. In 1952—the year in which the Octopus tradition was born—Detroit swept the Maple Leafs in four straight. Two years later, it took the favored Red Wings just five games to bounce Toronto. In 1955, Detroit once again swept the Leafs on their way to their fourth and final Stanley Cup of the 1950s. By 1956, disgruntled Maple Leafs fans were growing a bit restless. After the Wings won the first two games of the ’56 semi-final at home, the series moved to Toronto. The Maple Leafs and their fans, however, had additional reason to be angry. Lindsay recounted the proceeding events in an interview later on. If this idiot’s plan was to throw Howe and Lindsay off their game, it backfired. Miserably. Instead, the threat deeply angered the two. Word of the death threat even reached Howe’s 70-year-old mother back in Saskatchewan and, naturally, it upset her. That’s what really made Howe furious. 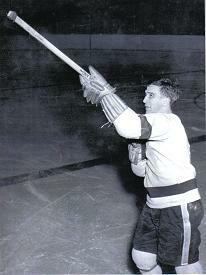 You did not want to make Detroit’s feisty captain, Ted Lindsay, mad before, during, or after a game. Angered, but able to control their emotions, Howe and Lindsay approached Game 3 determined to win. They didn’t let the threat take their brains elsewhere, as evidenced by Lindsay’s anecdote about Howe suggesting that rookie Marcel Bonin wear his #9 jersey during warmups. Later on that night, near the half-way point of the third period, the Leafs held a 4-2 lead. Howe scored at 9:11 to make it close at 4-3. A few minutes later, Lindsay tied it up. It remained that way for the rest of regulation time. At 4:22 of the first overtime period, Lindsay scored again, assisted by Howe and Bob Goldham, securing a 5-4 victory and 3-0 series stranglehold for the Red Wings. Lindsay wasn’t quite done, yet. Ted Lindsay’s infamous response to the death threat made against him and Howe. “If I ever wanted two or three goals in my life, this was the night,” Terrible Ted added. Indeed, two-thirds of the Production Line responded with gutsy performances that night. The shooter threat backfired – something Red Wings coach Jimmy Skinner knew would happen ahead of time. They certainly stepped up their games to another level that night. And, on top of the win and gesture by Lindsay, Detroit’s captain also earned a bit of respect from Toronto’s angriest fans for standing up in the face of danger, whether the threat was ever real or not. The Red Wings went on to win the series in five games, before losing to Montreal in the Stanley Cup Final. Original box score from Game 3 of the 1956 Red Wings-Maple Leafs series.